Tonnages: 13,545 gross, 22,200 deadweight. Cargo Handling: Fitted with three electric deck cranes of 16 tons SWL suitable for grab handling. June 1971: Completed by Upper Clyde Shipbuilders (Clydebank Division Yard No. 102G) for Lambert Brothers (Shipping) Ltd., London. Scottish Ship Management Ltd., Glasgow managers. Bareboat chartered to British Phosphate Commissioners. 1975: Management transferred to Whitco Marine Services Ltd. Bare boat charter to British Phosphate Commissioners terminated. 1977: Sold K/S Seaway Sandpiper. 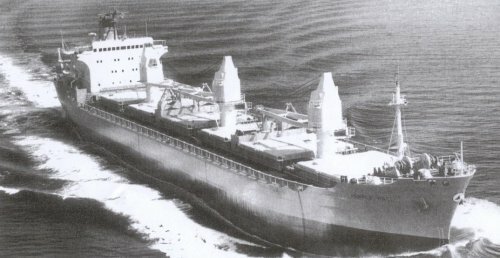 Arrived at Rosenberg Verft, Stavanger, on 10th January 1978 for conversion to a pipe burying ship, renamed SEAWAY SANDPIPER. 1990: Sold Sandpiper A/S. Westminster Offshore A/S managers. 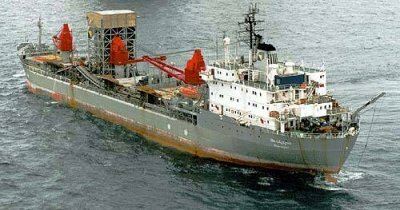 Listed as a stone dumping ship Norway (NIS) flag renamed SANDPIPER. Owners later became Boskalis Offshore AS Flag & name retained. As of 2005 the ship was still being operated by Boskalis as one of their two Fall-pipe vessels. The below photograph of her was sent in by Iain Benzie. For those who want to have a look at what she did, the following links will prove interesting. 2012: See below photograph. A credit to UCS and, of course, Boskalis Westminster. 2013: October, broken up at Aliaga, Turkey. Panama flag. The Temple Hall was notorious for the fact that she was the only Ruston engined ship which did not have to be towed into port after a breakdown at sea! This information from the BPC chief engineer, Peter Mondon, who sailed on her on her maiden voyage with Capt. Marking and who took her to be re-engined at Amsterdam.